Monemvasia (Greek Μονεμβασιά) is a town of 1,405 inhabitants, in the prefecture of Laconia, in southeastern Peloponnese. The name Monemvasia comes from the Greek words μόνη+εμβασία meaning single entrance, which perfectly describes the form of the old town, which could only be accessed through a causeway of 200 metres in length. The town is also known with the Italian version of its name, Malvasia, which is also the name of a local variety of grapes, used for the production of a sweat dessert wine. The locals, however, usually refer to Monemvasia as "the Rock". Many types of excellent wines are produced in the region of Monemvasia. The grape variety Malvasia, though, is no longer cultivated in the region. In 375 AC, Monemvasia was detached from the mainland, as a result of a very strong earthquake, taking the form that it has today. The same happened slightly southern with Elafonisos, which until the time of the earthquake formed part of mainland Peloponnese, whereas today it is an independent island. During the Medieval Period, Monemvasia was inhabited, fortified and flourished. The natural protection provided by the Rock, as well as the human-made fortifications, helped the town stand still through the years of piracy in the Mediterannean Sea. 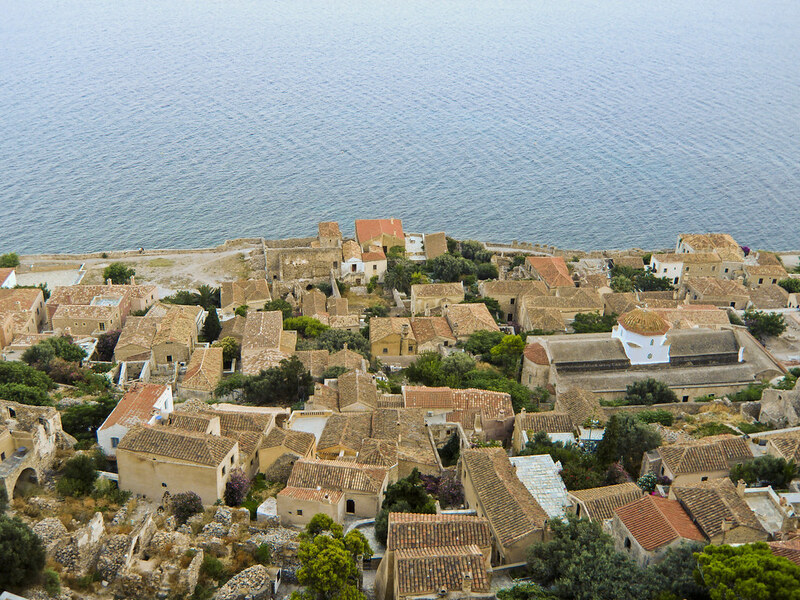 Nowadays, the town of Monemvasia consists of two settlements; the medieval settlement built on the Rock of Monemvasia overlooking the Myrtoan Sea with its perfectly preserved old buildings of outstanding architecture, and the newer settlement built at sea level at the other end of the causeway, on mainland Lakonia. The blue markers shows the location of various accommodations in Monemvasia. The letter in the marker describes the accommodation types: H for Hotel, A for Apartment, R for Resort, B for Bed & Breakfast and O for Other (e.g. pension, villa). Click on the blue marker for more information on the accommodation.